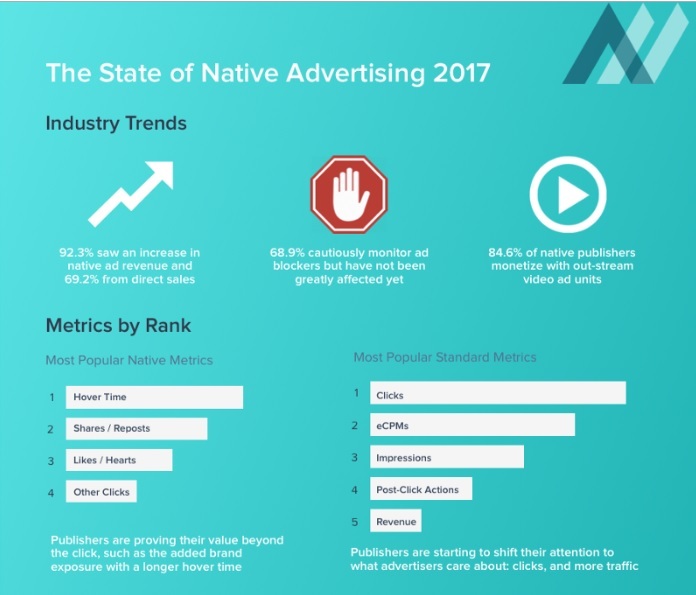 A recent survey by AdsNative entitled ‘The State of Native Advertising 2017 (According to Publishers)’ has revealed some very interesting statistics. The survey is based on the analysis of 7,500 web and mobile publishers during Q1 2017. As the Native ad format becomes more available a staggering 92.3% of the publishers in the survey have seen their native ad revenues increase in the last year, additionally, 68.9% have been monitoring the effect of ad blockers and they have noticed that their revenues haven’t been greatly affected by them yet. The survey also found that ‘Hover Time’ was the most important Native specific metric because it allowed publishers to show the value of Native ads beyond the click, proving that there is added brand and product exposure with a longer average hover time. The focus on clicks shows that publishers are shifting their attention to traffic, which is what advertisers care about. The survey also asked about programmatic trends and what publishers were looking at to scale up in 2017. 49% are expected to grow programmatic guaranteed, 34% will be pushing their vendors to run first-price auctions, and 17% are looking to implement server-side header bidding.